Possibly the biggest month in domestic anime history happened in November with the motion picture release of two of the biggest films from the land of anime. The first of those films takes us back to 14th century Japan and shows us a few things about our own situation as we move to the 21st century. It's a timeless story from master creator Miyazaki Hayao. Join the battle between man and nature in the highest grossing Japanese film of all time, Princess Mononoke. No, we didn't disappear. Lots of stuff has happened in the months since issue two. Tim tells everyone why you had to look at the Lain feature for three months. Opinionated? The Hypnotic Eye will have something witty (or not) for you here. You knew that we'd get around to it eventually. It's the Keeper of the Eye vs. The Wave that is Pokémon. Can the Eye catch 'em all? See in The Power of TeeVee and Pokémon. Anime review time! Ready for some magic? First up we have a great mix of aliens, fun and magic. The gang is back for the TV offering of Maho Tsukai Tai. 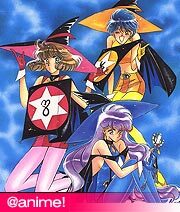 Then, we have swords, sorcery, action and, yes, MAGIC! It's Sorcerous Stabber Orphen. Finally, it's a futuristic battle with an unlikely heroine. Take a trip with Iria: Zeiram the Animation as Dave K. looks at the DVD version from US Manga Corps. Jenny takes us through a manga one-shot with Love Song, a set of four short manga stories all about, yes, you guessed it, love. In'it sweet? It's button mashing time! James shows us two new games based on some of the most popular anime titles of all time. First we have Macross VFX-2. Then we get a view of Gundam Side Story 0079. Next up, pull out your boombox and flip on some tunes! 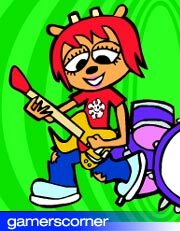 Maria shows us how to get down and funky with Um Jammer Lammy. Here we have a rarity in the anime world, a domestic soundtrack review. as part of this issue's feature, we take a look at the US release of the Princess Mononoke soundtrack.